Making friends was scary for me when I was a child. As a shy child I didn’t make friends easily. I worried that if I talked to one of the popular kids they would turn away. Fear of rejection. My mother joined me up for Girl Scouts where I could make friends. What a struggle it was for me. I preferred sitting at home reading books. I was encouraged by the leader to find girls who wanted to work on a badge with me. We would find a common place to create a friendship. Scouts was a good experience, especially when we worked on projects to help others. Girl Scouts was a good way for me to make friends, so when my daughters were young, I became a leader. In my troops I encouraged the girls to find a common place to make friendships. It could be selling cookies, sewing, learning about science, or any number of opportunities to learn how to work and play together in a fun way. Working together to help someone else gave me a sense of great joy. I found many volunteer opportunities and made more friends. Meeting new friends in these activities made my shy inner child feel welcome. I remembered the experience of being a shy child who was fearful of making friends and speaking. Now feeling comfortable with people, I could make a change to help kids feel more comfortable. I went into schools and taught young kids public speaking, and later became a volunteer Art Literature teacher. Friends of all ages entered my world, and to this day we bump into each other and enjoy the memories. Friends came into my life that I would never have met as a volunteer. Kind, caring and compassionate people. By working with caring people in a meaningful way you make the world a better place – a wonderful feeling. Sharing such a feeling with people created beautiful friendships. This life experience taught me a great lesson. Look for volunteer opportunities to make a difference. Here you will find a friend is waiting to meet you. Every opportunity in a volunteer capacity brought me many friends that make me smile to this day. By the way… “FEAR” is simply false evidence appearing real. When I was a child and afraid of rejection it was in my own mind. As I work with people in communication I remind them that it is usually a picture we create in our own mind. Look from another perspective. Face your fear. Release the fear. Look for a common place – kindness. 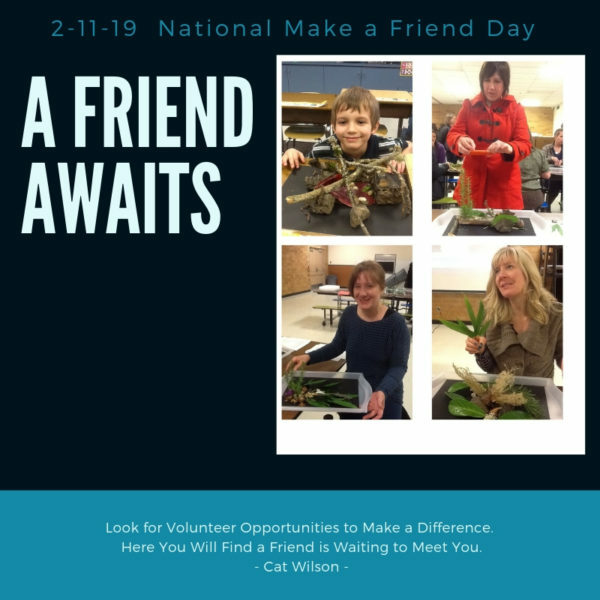 Today is National Make a Friend Day. If you are looking for friends and can’t find them, volunteer to help in an organization. Here you will find a friend awaits.